Considered by many to be the best receiver/amplifier of the 1970s (translates best-ever – period!) 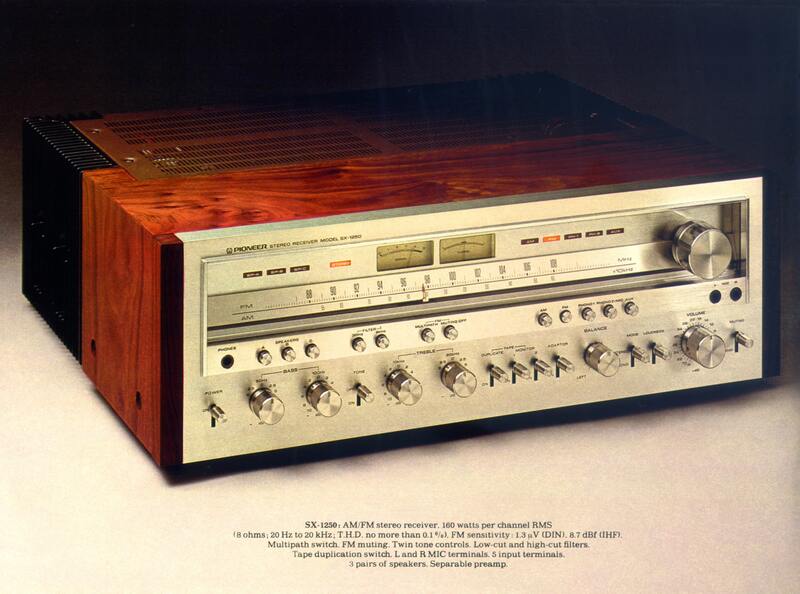 the Pioneer SX-1250 was the top-of-the-line model for the 1976-1977 Pioneer Receiver range. 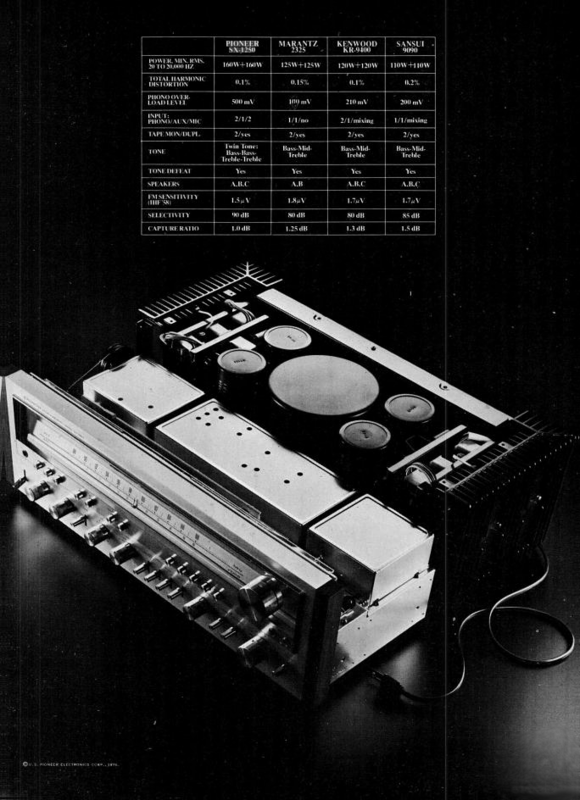 A product of the “Receiver Wars” no expense was spared in the design and engineering of this model and this is evident in the specifications, build quality and performance. Over the course of the 1970s Pioneer led the trends in terms of design and engineering of audio equipment with the majority of its major competitors shamelessly copying the styling of many Pioneer models. From the blue back light model Receivers of the early to mid-seventies to pressed aluminium silver tuning dials from the mid-seventies onwards. In terms of aesthetics the SX/50 series design was a dramatic departure from all previous silver fascia receiver designs to date with its silver pressed tuning dial and warm yellow glow and was quickly duplicated by the likes of Kenwood, Sansui, Marantz and Sanyo. Few brands such as Yamaha and Sony stuck to their guns with their own distinct styling. In Pioneers previous 1974-1975 product range the top-of-the-line receiver the blue-lit SX-1010 had made a world first by being the first 100 Watt RMS amplifier ever released and while the other manufacturers rushed to catchup with this beast Pioneer were slowly and deliberately planning a new monster. 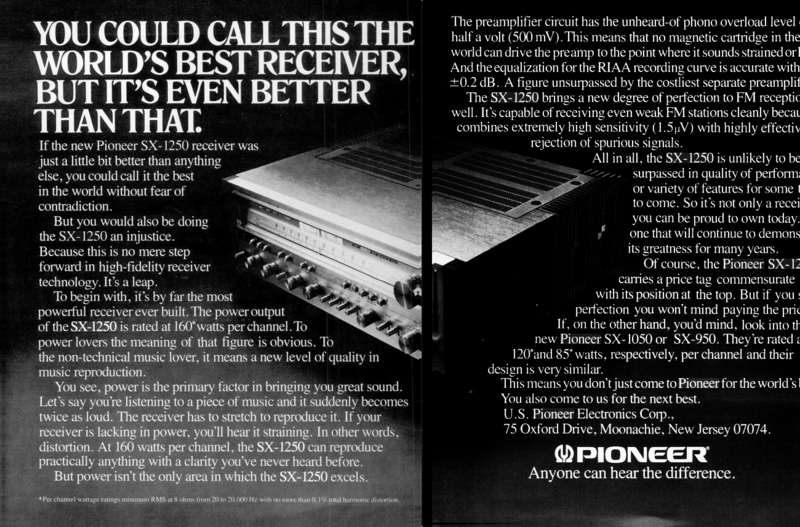 So when the SX-1250 was released in 1976 Pioneer again broke all previous power records boasting an enormous 160 Watts RMS per channel. 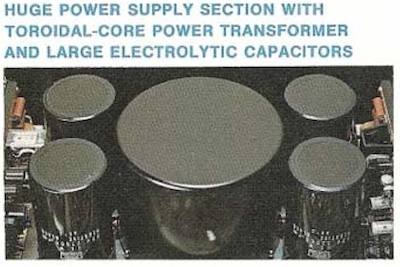 To achieve this unprecedented power rating Pioneer developed the now legendary power section of the SX-1250 with completely independent power supplies, including separate power supply windings, rectifiers and smoothing capacitors for each channel, the components of which include a massive 22 pound toroidal core transformer (less susceptible to power fluctuations and less likely to create noise than laminated core transformers) and four ‘Coke Can’ size 22,000uf filter capacitors. The amplifier section was composed of a 2-stage differential amplifier and a Darlington push-pull amplifier for the final stage. All stages are direct coupled in a pure complementary OCL circuit that includes a current mirror circuit. This combination delivered FTC regulation measurements of 160 Watts RMS per channel into 8 ohms from 20-20KHz with no more than 0.1 THD and 200 Watts RMS per channel with 0.1 THD into 4 ohms. The preamplifier section combines exceptional flexibility with superb sound achieved through utilising field effect transistors and CR type integrated circuits. The phono input has a 4-stage preamplifier equaliser with an RIAA correction of only +_0.3dB and a overload level of 500mV meaning no magnetic cartridge can strain the pre-amp. The designs of these sections were directly borrowed from Pioneer’s separate components. Pioneer never manufactured a unit to match these specifications ever again and this is one of the many reasons purists believe that this model is the apex of high fidelity sound. The now legendary SX-1980 from Pioneers 1978-1980 product range used essentially the same power supply to produce 270 Watts RMS per channel while the model intended to take over from the SX-1250, the SX-1280, had downgraded its capacitors to 15,000mfd even though it was rated 20 Watts RMS higher the the SX-1250! This receiver was meant to be the finest available then and as it turns out it remains one of the finest available to this day. it off 2 sets yes I said 2 sets of the biggest badest set of towers on the market Cerwin vega xls 215s not only blow your hair back but straight up as well . A very understanding Wife Is A Bonus as well! I concur with thisrticle I’ve had one since 76! I am selling my sx-1250 pioneer receiver. It is in excellent condition and works like it did the day it was made. Kelly have you sold it yet? If not how much are you asking? Kelly have you sold it yet? I am interested, give me an email at aeleneiadrian81@gmail.com. Also interested in the sx1250 Kelly. Guessing it’s gone, but if not. Had mine recapped three years ago and now just picked up from some additional maintenance (cleaning). This is how one “feels” the music. Thought I might sell it until I heard it again. It’s staying put! I have one and i cant believe how good it still sounds. I also have a tape deck and turn table and they produce a sound that you could only imagine and i have them hooked up to two pair of fisher speakers . man what a sound. And they all could be bought. I also have a working sx1250 for sale. Make an offer. I am also selling my sx-1250 Pioneer. I am the original owner, bought new in the 70’s. I have original manual and even the original receipt. It has been kept in mint condition and looks and sounds like it came out of the box yesterday. I cannot deliver or send it due to my health limitations, so you would need to pick it up in the Tampa, Fl area. Is your 1250 still for sale? Yes Dino I still have the 1250. I have not advertised it or taken any steps to sell it at this point. I was about to put it on eBay in the next day or so, but before I do that if you are interested let me know. Do you still have the SX-1250 for sale. If you do can you call me at+18032604353 anytime, thanks. Sorry James, but I sold it over the weekend. I am happy that it went to someone who really appreciated it and will enjoy it as much as I did. It was a great receiver! It was not so easy to let it go honestly, but I am in the process of downsizing my home. Best of Luck with landing one and hope you enjoy it. I have a sx 1250 since 1976 I purchased a just like new Sx 750 for 40 dollars at a goodwill store this past summer. I felt like I was taking advantage of them but I got over that.